As the weather turns nice, you may notice flies have begun to infest your yard and home. Nothing is more frustrating than constantly swatting away flies while you are trying to enjoy your summer barbeque. While you may think that flies are relatively harmless, they carry dangerous diseases including cholera and salmonella. Like a majority of people in the world, you would probably like to know how to keep flies away from food and drinks while you are outside without using harsh chemicals that may be toxic. Using strong smells around your patio, kitchen, and storage rooms will help to keep fruit flies away from food and drink. Here are 17 great fly control ideas for keeping flies away from your food and drink. What Are Fruit Flies and What Are They Attracted To? Are Drain Flies like Fruit Flies? How Can I Get Rid of Drain Flies? Where do fruit flies come from? They are small insects that are often found in and around the fruit. While they eat a variety of food, they prefer to eat things that are fermenting or decaying. 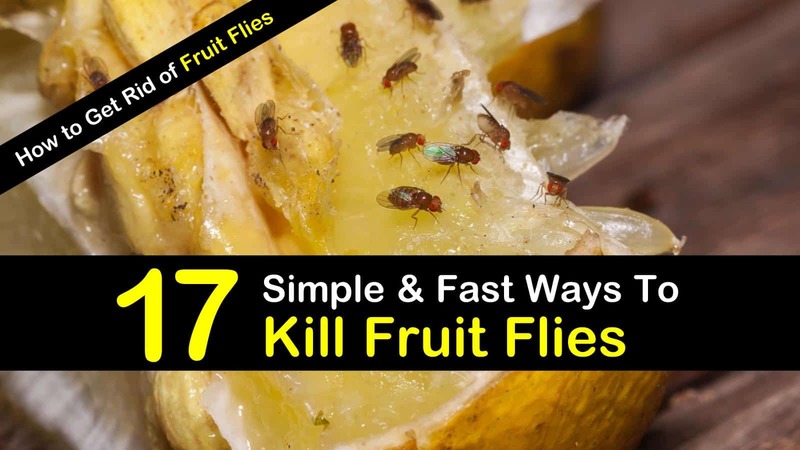 To keep them from your home, make sure you rid your house of any items that have begun to rot and use traps specifically designed to take care of fruit flies. 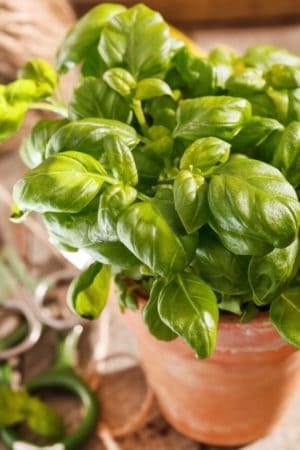 Basil is a pungent herb that has been used to repel flies for thousands of years. The hearty plant is easy to maintain and can survive in just about any climate and will keep house flies from entering your home if you plant it by your doors and windows. Place a bunch of basil in a vase and leave in your kitchen to keep flies from getting near your food inside. Bay Leaf is another herb that can be used to keep flies away from your food and drink. The bay leaf produces a subtle smell that flies can’t stand. Grow this versatile herb in areas that are infested to keep flies away. Bay leaves are also great for repelling moths, earwigs, roaches, and mice. It can be held outside during the summer months, but you should bring it in when the weather turns cold. You can also spread dried bay leaves near your patio, or keep dried leaves in a container in your kitchen to help repel flies. Lavender has a unique place when it comes to getting rid of house flies around your home. The delightful fragrance that is enjoyed by many is an excellent fly repellent. Just like lemongrass which is keeping wasps away; flies, moths, and fleas can’t stand the sweet smell and will steer clear of any area where you place lavender. To repel outdoor flies, you can plant lavender in your garden. To keep flies out of your storeroom and kitchen, you can put dried lavender close to the area of infestation or use a homemade fly repellent using lavender oil. You can find the recipe below. Mint is an inexpensive and extremely useful house fly repellent. Both the fresh and dried forms of the plant will help to deter fruit flies, as well as ants, stink bugs, mice, and mosquitoes. Along with planting peppermint in your yard, you can place crushed mint leaves in a shallow bowl or fill some muslin tea bags with dried mint and leave them in an area that is infested to keep fruit flies from getting to your food. Tansy is another herb that is perfect for keeping fruit flies away. Tansy is a great plant to place in your garden, or close to your outdoor living space to help keep flies away from your food when you are eating outside. The marigold-looking plant will also help to repel mites, bedbugs, ants, roaches, mosquitoes, and mice. The flowering herb helps getting rid of gnats and has also healing properties but may cause dermatitis in certain individuals, so you should use caution when using this plant to deter flies. Another useful herb to use in your yard to repel flies is woodworm. It has grayish green leaves and yellow flowers and has been used as an insecticide for hundreds of years. Planting this herb near your doors will help to repel flies and other pests like ticks, moths, and fleas. A woody plant, rue acts not only as an insecticide but as a disinfectant as well. It is perfect for repelling fruit flies, mosquitoes, and other insects naturally. Crushing the leaves of the rue plant is another way you can keep flies away from your food and drink. 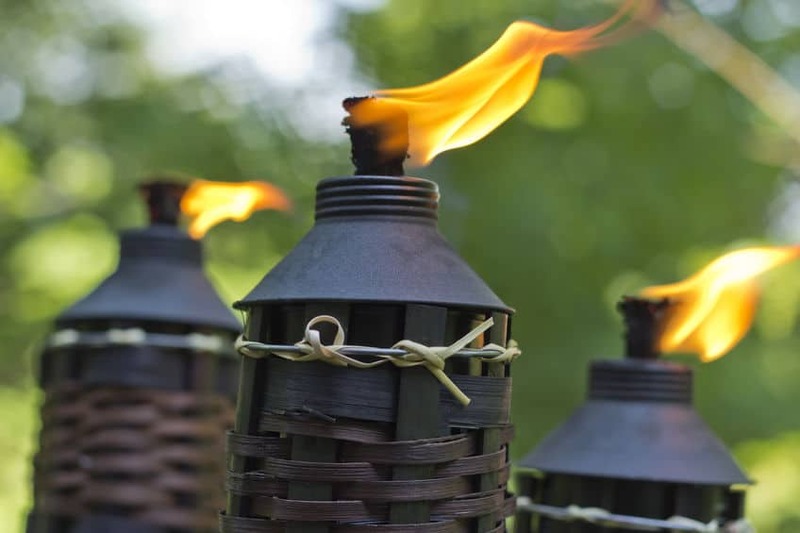 To keep flies away from your barbeque, place citronella candles around the table or tiki torches with citronella around your patio. Not only does the flame create a relaxing ambiance, but the smoke will keep flies from entering the area and is one of the best ways to repel mosquitoes. When you are trying to enjoy a barbeque, you can keep flies away from the food and drink with a simple trick. Take several glasses or a plastic bag and fill them with water. Place a few pennies in each of the glasses and put them on your table. The flies will take one look at the glasses and leave the area. People believe that the flies see the pennies as the eyes of larger bugs and will steer clear of the table. Placing bug zappers around your patio will keep flies and other insects away from your barbeque. The bug zappers use ultraviolet light to attract the bugs. When the flies enter the housing and touch the grid, a high voltage electric shock travels through their body, burning them from the inside/out. Bug zappers come in a variety of shapes and sizes and can be purchased at most home improvement stores or can be found online. If you are having problems with fruit flies in your kitchen, you can use vinegar traps to eliminate the reproductive adults. By placing a few cider vinegar traps around your kitchen to quickly get rid of fruit flies. You can make your vinegar traps by following the detailed steps found below. There are many different essential oils that you can use to repel flies from the area where you are eating. You can use lavender oil, citronella oil, peppermint, lemongrass oil, pennyroyal, or eucalyptus oil to create your essential oil candles. Below, you can find the instructions for making your own DIY “bug away” essential oil candle. Before you sit down outside to enjoy your meal, set up a box fan near your table to help keep flies and other bugs from getting to your food. Flies can’t stand breezes, so the fans will keep them at bay while also providing you with a way to cool off. There are several kinds of commercial fly traps that you can use to keep pesky flies away from your food and drinks while enjoying your outdoor space. The Captivator Fly Trap uses the pheromones of flies to trap them in a one-way entry system, keeping them trapped. They are reusable and economical and has a capacity of two quarts. Alternatively, you can make your own DIY flypaper trap. As shown in our guide on how to get rid of house flies, turn an old index card into the perfect fly trap. While you are enjoying your outdoor party, keeping your drink covered with plastic wrap will allow you to keep flies from landing on it and going for a swim. Placing a cover over the mouth of your glass will enable you to leave the table without the worry of coming back to floating flies. To keep fruit flies away from your gathering, use a glass of red wine. You can pour some into a cup and put somewhere away from your patio. The sweet smell will attract the fruit flies, drawing them away from your patio. Make sure to label the glass, so you or your guests won’t accidentally take a sip. These devices not only repel mosquitos but are also perfect for keeping black flies away. The device uses butane, so you don’t have to worry about plugging it in or bringing extra batteries. You can find the ThermaCell portable mosquito repellent device at home improvement stores like Home Depot or online. Put the apple cider vinegar in the cup. You want to use about an inch. Use the scissors to cut off the corner of the plastic bag. Don’t make the hole too big; it needs to be big enough for the flies to pass through, but not big enough for them to get back out. Placing the bag over the opening of the cup, make sure the hole you created sits in the center of the glass. Form a funnel by pushing the snipped corner down into the glass. Make sure the corner doesn’t touch the vinegar. Secure the bag over the glass with the rubber band. Place the trap in areas where you are having problems with fruit flies. Empty the trap as needed and refill with fresh apple cider vinegar. Slice the lemon and lime into ¼ inch slices. Add approximately ten drops of the essential oil blend of your choosing to the water. Place a few sprigs of rosemary into the bottom of each mason jar. Put two lemon slices and two lime slices on to of the rosemary. Pour the water with the essential oils into the mason jars. Make sure to leave about one inch at the top of the jars. Place one candle into each jar. Light the candles and place on your table. In a spray bottle, mix the ingredients and spray any areas where you need fly control. Mix the ingredients and store in a plastic storage container. Mix 1 part of the Fly Spray Concentrate and five parts water in a spray bottle. Shake well before using and spray an area where you want to get rid of flies. Drain flies feed on the damp, organic materials that are often found in pipes. While they are not known to transmit diseases like other flies, they can be a nuisance. To kill the adult flies, use a chemical spray, a particular trap for drain flies, fly swatter or liquid dish soap. You will also need to clean your drain by pouring warm water down the drain and using a metal pipe brush to clean out any grime. After this is done, pour drain cleaner down the drain to destroy the drain fly breeding source. The summers are the perfect time to get outside and enjoy a nice barbeque with your friends and family, but unfortunately, you’re not the only one enjoying the food. The warmer weather inevitably brings out pesky flies in droves. Along with being a nuisance, they can also transmit dangerous diseases. 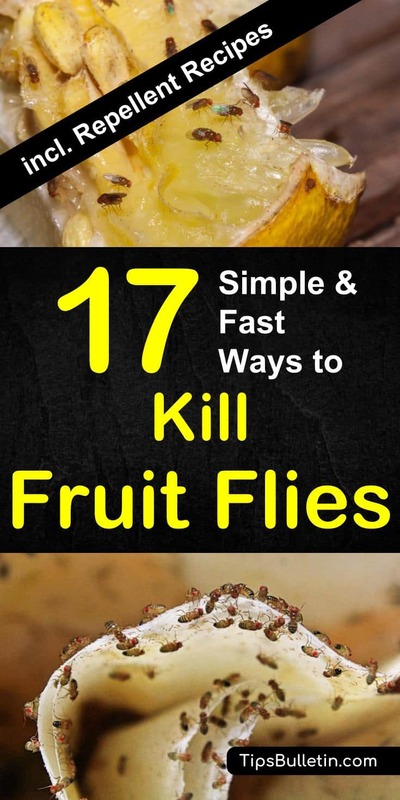 That’s why we have provided you with these simple ways to how to keep flies away from food. If you found this article helpful, please share it with your family and friends.